Organ situated atop the kidney, not part of the urinary system; it secretes various hormones of the steroid and adrenal families. Outer portion of the renal tissue inserted between the Malpighian pyramids; it is made up of small vesicles that filter the blood and produce urine. Organ located beneath the gallbladder; it filters the blood and secretes urine to eliminate toxic substances and waste from the body. Inner part of the renal tissue made up of Malpighian pyramids, cone-shaped structures that connect the urine collection canals. Crest of the Malpighian pyramid (cone-shaped striated structure) made of urine collection canals; it opens into the calyx. Excretory cavity of the kidney; it collects urine flowing from the papillae and opens into the renal pelvis. Broad section of the excretory renal tract resulting from the juncture of the calyxes; it extends into the ureter. Large vein collecting blood from the kidney; it flows into the inferior vena cava. Branch of the abdominal aorta circulating blood to the kidney. Branch of the abdominal aorta that supplies blood to the ascending colon and half of the transverse colon. Branch of the abdominal aorta circulating blood to the descending colon and half the transverse colon. Membranous canal enabling the evacuation of urine. In the male, it also allows sperm to pass. Muscular reservoir where urine from the kidneys collects before being evacuated through the urethra. Branch of the common iliac artery flowing to the pelvis, the genital organs and the inner thigh. Branch of the abdominal aorta that circulates blood to the pelvis and the lower limbs; it divides into the internal and external iliac arteries. Long muscular membranous canal extending from the renal pelvis; it carries urine from the kidney to the urinary bladder. Fourth segment of the aorta circulating to all the organs and to the walls of the abdomen; it branches into the common iliac arteries. Organ located beneath the liver; it filters the blood and secretes urine to eliminate toxic substances and waste from the body. 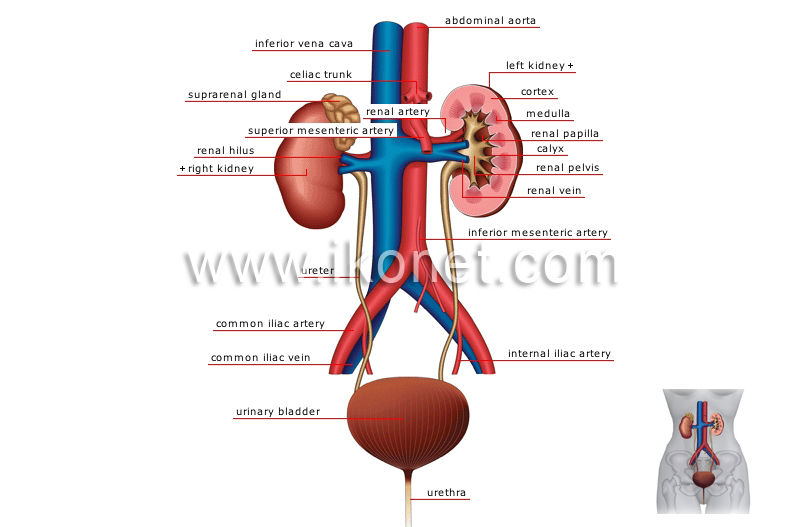 Opening of the inner edge of the kidney allowing the passage of blood vessels, nerves and the ureter.